No surprise either – the upcoming series of Doctor Who with Jodie Whitaker taking over the title role will also see a new stylized title logo and a new opening. See it below! The lost Doctor Who episode “Shada” is getting a complete release! The Doctor Who episode “Shada” is legendary…unlike other incomplete episodes, which were due to the BBC purging the film archives of some of the original masters, Shada was never completed. The final episode of the 17th season, starring Tom Baker and written by Douglas Adams, had production canceled part way through due to a strike at the BBC. When the strike ended, the schedule had slipped too far into the holiday programming production time and ultimately it was never resumed. Douglas Adams was reportedly fine with the episode remaining in the annals of legend, unhappy with the script in the end. Since then, the episode was released in its incomplete form with some narration to fill in the missing parts, and also retooled as an audio drama for the Eighth Doctor. Now the original is getting the BBC’s latest method of filling in lost episodes – by animating them! Last year, they restored Patrick Troughton’s debut episode, ”The Power Of The Daleks”, by reconstructing the missing parts with animation. As an added bonus, not only does Tom Baker lend his voice to the animated segments, but also filmed a new segment with an appearance by K-9! The episode follows the Doctor and Romana as they are called to Cambridge by Dr. Chronotis, a “retired” Time Lord who holds the key to the location of Shada, the prison planet of the Time Lords. A alien genius, Skagra, wants the location to be able to harness the collective intellect of the most notorious criminals in the universe so that he may take over, well, everything. The new release is available today on iTunes (at least in the UK – I don’t see it in the iTunes store in the US), and a DVD release in the UK on December 4th and the US on January 8th. Yes, Pearl Mackie will return for the Christmas special…as does David Bradley, who played William Hartnell in the 50th anniversary docudrama An Adventure In Space And Time – except now he’s playing the first Doctor! Another passing in the Doctor Who family…actress Deborah Watling, who played Victoria Waterfield at the end of the fourth season and most of the fifth season of Doctor Who as a companion to the Second Doctor, Patrick Troughton, passed away yesterday at the age of 69. Watling, remembered for her frequent screaming when confronted with aliens, first appeared in the second episode of “The Evil Of The Daleks”, and through “Fury from the Deep”, the second-to-last serial of the fifth season. Most of her appearances, however, have been lost due to the wiping of tapes at the BBC. 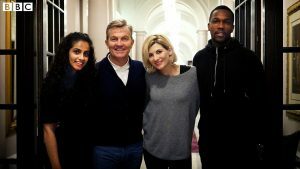 Her first appearance is the only part of that serial that currently survives, and only “The Tomb of the Cybermen” and “The Enemy of the World” exist in their entirely today, the latter of which only had one part until 2013 when several episodes were recovered at a Nigerian TV relay station. Watling reprised the role in the 1993 Children In Need special Doctor Who: Dimensions In Time among many former Doctors and companions, and also appeared in the 50th Anniversary spoof The Five(ish) Doctors Reboot. She was also known for roles in the 1958-1959 series The Invisible Man and Take Me High. And the new Doctor is… Jodie Whittaker ! BBC announced moments ago the BBC announced live after the Wimbledon men’s final the new Doctor will be Jodie Whittaker, who played Beth Latimer on Broadchurch…and we finally have our first female Doctor! 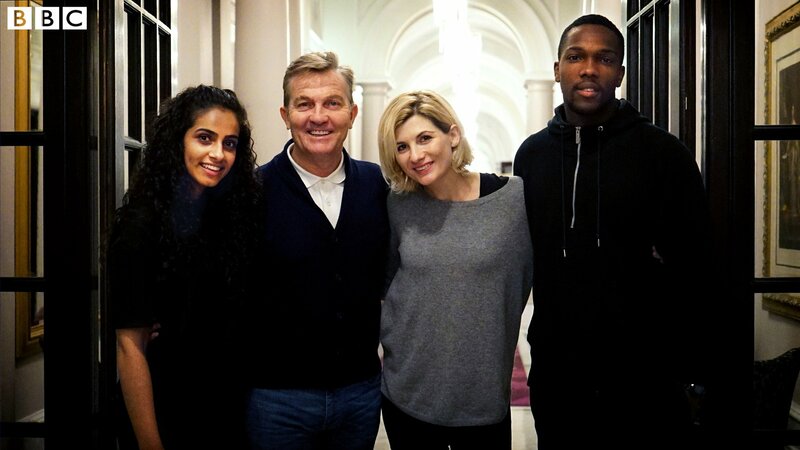 This reunites her with Chris Chibnall, who was the writer and executive producer on Broadchurch and is taking over the showrunner duties on Doctor Who from Steven Moffat. The successor to Peter Capaldi as the Doctor in Doctor Who (officially the 13th, not counting the War Doctor or the semi-10th duplicate) will be announced by the BBC and BBC America after the conclusion of the men’s final at Wimbledon on Sunday. As the time it takes for the final is indeterminate, for U.S. viewers it starts at 9am Eastern, and is expected to run 2-3 hours. How BBC America will handle the announcement is uncertain – they will certainly post on their Facebook page, but they might cut in to the live BBC feed when it happens as well. When we know, we’ll post as well. And the next Doctor Who might be…?!? This is not confirmed, and the source is The Mirror, but if the bookies have stopped taking bets, something is up…but The Mirror reports that the next Doctor will be actor Kris Marshall, who recently starred in the British series Death In Paradise but recently announced he is leaving the show. If you’re not familiar with the name, you might be familiar with the face if you’ve ever seen the movie Love Actually…he’s the one that went to America to meet girls. I’m not sure I can see it but I only really know him from the film, and that certainly isn’t a character I can see as the Doctor, but I’ve been surprised by actors before. In the trailer posted below, we do see the Doctor start to regenerate – which indicates he will regenerate no later than the end of Series 10 and NOT in the Christmas episode as had been done for Smith and Capaldi, and the Mirror’s source says Marshall had already joined the show.